(Bloomberg) -- German Chancellor Angela Merkel praised China for opening up to foreign investment, drawing a contrast with trade conflicts burdening both countries’ relations with the U.S.
Merkel’s positive take followed a meeting on Monday in Berlin with Chinese Prime Minister Li Keqiang, who presented himself as an ally in her defense of rules-based global trade. They also agreed that they want to preserve a nuclear accord with Iran that President Donald Trump has ditched. At an event hosted by Merkel and Li, BASF SE signed a preliminary accord to spend as much as $10 billion on a second chemical complex in China, its largest expansion project yet. The German company will own 100 percent of the site in Guangdong, the first foreign chemical maker to go it alone in China. “This shows that China’s market opening in these areas isn’t just talk, but action,” Merkel said at a joint news conference. Combined with Chinese steps to open up to foreign financial companies, it’s a signal that multilateralism plays “a strengthening, bolstering role” for the world economy, Li said. To read more about German industry’s push for China market access, click here. Two days before meeting Trump at a NATO summit in Brussels, Merkel expressed concern about trade conflict with the U.S. and said the European Union will retaliate if the administration expands tariffs on European exports. “We should try to reach a deal, otherwise we will be forced to take action” as the EU did in retaliating against U.S. tariffs on steel and aluminum, the German leader said. “I can’t imagine anyone can hold back the stream of globalization,” Li said. 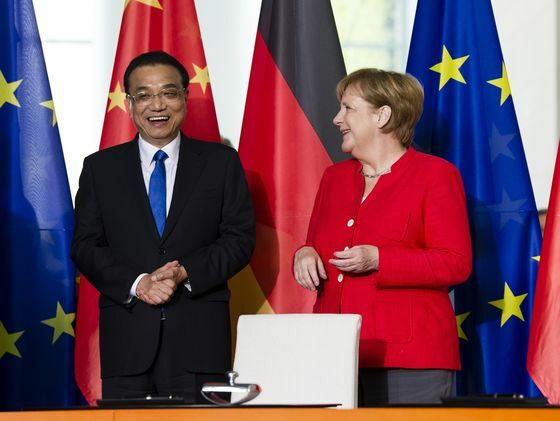 Merkel said Germany’s goal remains a level playing field in economic ties with China. At the same time, she said Germany reserves the right to block Chinese investments under existing laws that allow such restrictions for sensitive technology or on national security grounds. That doesn’t mean China is being singled out, she said. “There’s no trade policy that’s specifically directed against China,” Merkel said. Alongside the government talks, Contemporary Amperex Technology Co. said it’s choosing Germany’s eastern state of Thuringia as the site of a battery factory. That means China’s biggest maker of battery cells for electric vehicles is planting its flag in the land of Volkswagen, Daimler and BMW.